The biggest problem the voters have is trying to tell the difference between the candidates who shoot hot air and the real deals. Fortunately, Missouri Right to Life has done extensive homework to make it clear for us to know. 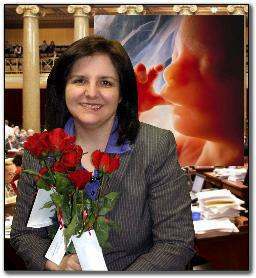 In what could be a game changer in November, former State Representative Cynthia Davis became the only candidate to be endorsed as the Pro-Life candidate for Missouri Lt Governor by Missouri Right to Life. No Republican or Democratic candidate running for Lt. Governor received the endorsement of this respected and influential group. Cynthia Davis is running a true grass roots campaign on the platform of “Principles, not Politics” and holding the others accountable. She has been speaking at rallies, 9/12 groups, property rights councils, Tea Parties, patriot groups and women’s organizations throughout the state. Never before have so many voters been disappointed with the options offered by the Republican and Democrat parties. “Republicans claim to be Pro-Life, but have failed to offer their voters any real choices on the ballot for those who want a Pro-Life option. The Democrat Party doesn’t even pretend to care about life issues, though many individual Democratic voters are Pro-Life and welcome the option of voting for a candidate who respects life. “With the majority of Missourians wanting a champion for Pro-Life issues, I am happy to have this endorsement and the support of thousands of informed Pro-Life voters who want to elect people of principle to office,” said Cynthia Davis. Missouri Right to Life only gives their endorsement to candidates who have demonstrated a commitment to Pro-Life issues including opposition to abortion, human cloning, assisted suicide and euthanasia. While Cynthia Davis was in the Missouri House of Representatives, especially while serving as the Chairman of the Children and Families Committee, she proved her unwavering commitment to life. Missouri Right to Life is the oldest and most credible Pro-Life organization which estimates there are over a quarter of a million informed Pro-Life voters in our state.